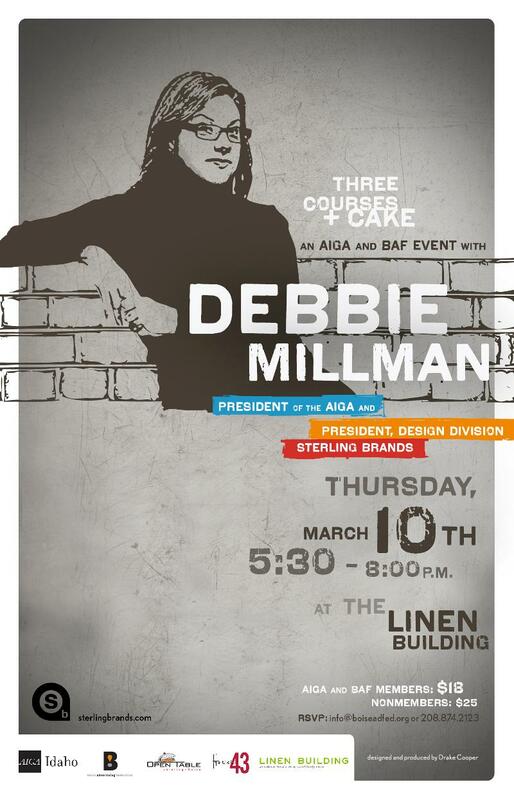 AIGA Idaho and the Boise Advertising Federation are presenting Three Courses + Cake with Debbie Millman on Thursday, March 10th from 5:30 p.m. – 8:00 p.m.
Debbie Millman is President of the Design Division of Sterling Brands, and President of AIGA, the professional association for design. She has worked in the design business for over 25 years, including nearly 15 years at Sterling Brands. She also has a fourth book, due out in October, titled Brand Thinking and Other Noble Pursuits . This event is being held at the Linen Building in downtown Boise. Space is limited and RSVPs are strongly recommended. Cost is $18 for AIGA and BAF members and $25 for non-members. RSVPs can be sent to info@boiseadfed.org or through the event page on Facebook.